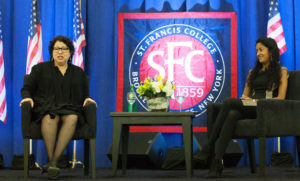 USSC Justice, Sonia Sotomayor, and Sparkle Sooknanan, St. Francis College class of ’02. 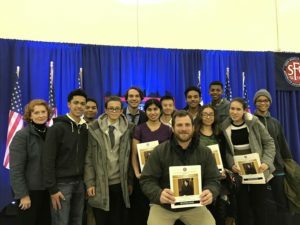 On February 2nd, WHSAD Students who have done exceptionally well in their social studies classes were selected to see a conversation with Supreme Court Justice Sonia Sotomayor at St. Francis College. This conversation was a part of the Thomas J. Volpe Lecture Series. She discussed topics ranging from her own life story growing up in New York City, to the stresses of figuring out what to do after college. She also discussed her career as a lawyer and a judge leading up to her nomination and appointment to the Supreme Court. She often drew from her experiences and education to send a message of hope and determination in order to encourage students to push themselves and achieve their goals. To learn more about St. Francis College click here. To learn more about Justice Sonia Sotomayor and the Supreme Court, click here. 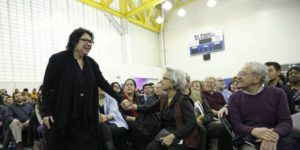 Justice Sonia Sotomayor walks throughout the audience as she speaks.